Looking for an outdoor kitchen builder in Fort Myers, Estero or Naples? Are you wondering what does an outdoor kitchen cost? Then you have come to the right place! Learn more about our company and the process by visiting our FAQ's. To see the outdoor kitchens we have built view our outdoor kitchen pictures online. We want to help you capitalize on our great Florida weather, by getting out and enjoying it! Let us build your outdoor kitchen in Fort Myers, Estero or Naples today! Elegant Outdoor Kitchens of Southwest Florida is now an accredited member of the Better Business Bureau, also known a the BBB. The BBB Seal of accreditation (which you can see below) means that the Better Business Bureau has determined that Elegant Outdoor Kitchens has consistently met Better Bussiness Bureau standards and practices, which include a commitment to make a good faith effort to resolve any consumer complaints should they arise. 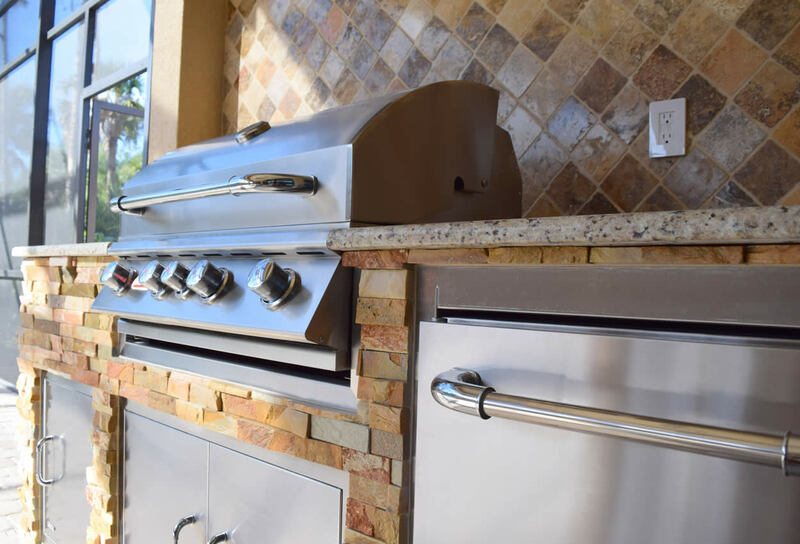 The Better Business Bureau accreditation is just another way that Elegant Outdoor Kitchens of Southwest Florida strives to demonstrate our total commitment to our valued customers. We're here for all your custom barbecue island and outdoor living needs. Elegant Outdoor Kitchens Stands Behind Our Professional Work! We stand behind our work. If you have a problem, call us, we want to make it right. The appliances come with the vendor warranty. The granite, base framing, rock and workmanship will come with a lifetime warranty for as long as you own the home.